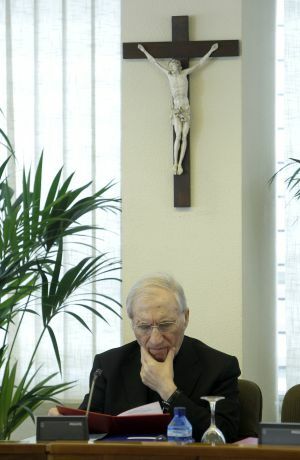 Cardinal Antonio María Rouco, former archbishop of Madrid, was Kiko's first "purchase". And above all, Kiko will provide Rouco with political influence. At a meeting in Rome in October 2007, during the beatification of 468 Religious assassinated in the Civil War, Arguello will propose to the Cardinal organising a great demonstration in Madrid ‘in defense of the Christian family’. There are barely three months left before the general elections. The polls predict a technical draw between the PSOE (Socialist Party of Spanish Workers) and the (right wing) Popular Party. Rouco is doubtful. It seems precipitate. Arguello reassures him, ‘Don Antonio, I will put 300,000 kikos in Columbus Place’. Rouco agrees. The demonstration takes place on October 30. Various Cardinals and 42 Bishops attend. Sold to the bidder who wants more than heaven can offer.....Poor Archbishop Anthony and the NEO CULT Leadership in Guam's Chancery.....The price you paid must be covered up through lies and deception in order to keep the $$ flowing..... O what a web you have woven when you continually practice to deceive.... 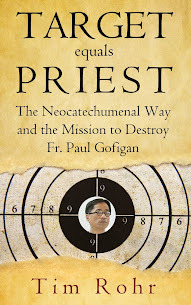 The next Shepard (hopefully not from this NEO CULT) will have a hard time undoing the damage done to the True Catholic and Apostolic Church in Guam.....Not a good time to pray for vocations because the men who answer that calling will be forced to attend the NEO CULT Factory in Guam instead of a formal seminary off island that is fully accredited and affiliated with the True Catholic and Apostolic Church. Accepting easy money to buy happiness never the way to go in life. Why would a cardinal or bishop even need to accept envelopes to determine the end result? It doesn't always have to be money. Power, pride, prestige are always great temptations. Pope Francis ordained 19 priests to his diocese of Rome. Wonder how many were neo presbyters? They are big in Rome. BUT, bet they avail themselves of better educations. Archie is educating two big degrees over there now. Then David and Adrian can retire with Fr. R.
Make no mistake, there is money involved. Lots of it. 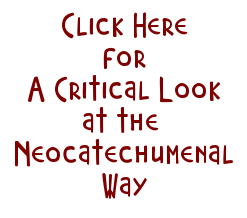 It all has to do with unwitting NCW communities. But they are instructed never to question. It's time they did because they are being lied to. It's akin to embezzlement. The federal authorities should look in to this. To Anon 3:39, 9 are from the Neocatechumenal Way's seminary in Rome. Apuron was never archbishop material. His faith is shallow and not rooted in living the example of Christ. The Catholic Church on Guam will survive the arch's treachery. We who are faithful to our Catholic beliefs must be steadfast in our determination not to let Apuron and his neo puppet masters have the last day in how we live out our Catholic faith. We are being tested now. Long after the arch is a forgotten part of our island's history, the Catholic faith will still be strong on Guam. He is not the Church. We are! How much has Archbishop Apuron hidden from Guam's faithful Catholics for his Golden Parachute when he is forced to retire at the age of 75. I remember how the late +Archbishop Flores lived; he had one car and drove himself to every church event.... The Archbishop's residence where Saint John Paul II stayed was simple.....three years after Archbishop Anthony becomes Archbishop, the home that was simple, was reconstructed, the interior almost matching the governors home......Thousands of $$ was spent on decorating the home for Christmas. Archbishop Anthony even leased two luxury Lexus's (one black and the other white)..... Imagine how many charities and schools that would have been saved had these unnecessary expenses at the cost of our generous donations were not recklessly spent . I fear that what is happening in Madrid for Cardinal Roucio will happen here in Guam..... The archbishop has the money.....let him use that parachute to save the legacy that was passed on by the late +Archbishop Flores....... STOP the money....If this Capuchin truly lives up to his vow of poverty, he will use his parachute to save his beloved NEO Church. Richard that is a question few asked about. Watchdogs believe estimated ill gotten wealth around $10,000,000. Ten million dollars stashed away somewhere is quite a nest egg. All from generous donors I suppose. NOT!! The word PLUNDER comes to mind. Poor tan Maria and tun Jose who donated to the Church thinking it was for the good of ALL the Church. Oh my. The very same controversy surrounds the retirement plans of the Archbishop of Newark in New Jersey. Can you believe that? Click here to read the details. "Private donors" are said to be helping Archbishop Myers. True Chuck. CNN did a good presentation two years ago on the intended retirement home for Archbishop Myers. Unfortunately these guys in the mould of Apuron think they are absolute monarchs in their own right. It is interesting to note that the so called Pronlem bishops involving money and high living are often associated with Kiko. They tend to form same manner of doing things when you study closely. This particular cardinal rouca is not on good terms with the Holy Father because of financial matters. Same is true of others. These money-hungry bishops are a disgrace to the Catholic Church. They need to be expunged but the Vatican bureaucracy does not have the will to correct these straying bishops until they become such a scandal that can no longer be brushed under the rug. Ah...the Catholic Church that I love, the Catholic Church that never learns. The greedy, money hungry bishops and cardinals need to be laicized and thrown out onto the streets where they may fend for themselves. They have disgraced themselves and don't deserve any kind of respect and/or protection from Rome. Arch A Bishop! The Pope just said stop giving boring homilies. Cut your worthless activities for the rest of the week and prepare your homily properly. After the Capuchins paid so much for your education. You are not inspiring to your seminarians.